Able to dunk backwards with two hands on his high school basketball team in Beaver Falls, Penn., Namath suffered a knee injury at Alabama, which grew worse through his playing days. But he was able to throw a perfect spiral 60 yards to his target without taking a step. 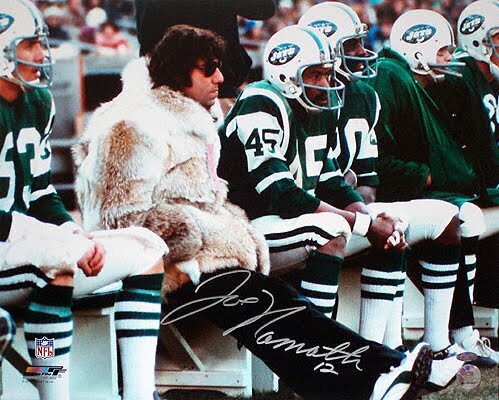 Namath was a legend. Girls wanted to kiss him and boys wanted to be like him. Broadway Joe Namath could sell Ovaltine and pantyhose. He popularized the bachelor life at a time when it was not in mainstream society. And he wasn’t shy about his desire for late nights drinking with Mickey Mantle, mobsters and models. As he once said, “I like my Johnnie Walker Red and my women blonde.” The next day, hangover and all, he would deliver. He’d guarantee it as he did before the Jets Super Bowl III victory. Today marks the 40th anniversary of the Jets Super Bowl victory over the Colts.